The People's typewriter was the name of this large index typewriter that was produced in 1885 by E. Prouty of Chicago as a cheap alternative to the large and expensive typewriters. The design was patented 30 years earlier by Robert Thomas of Wilmington, NC. 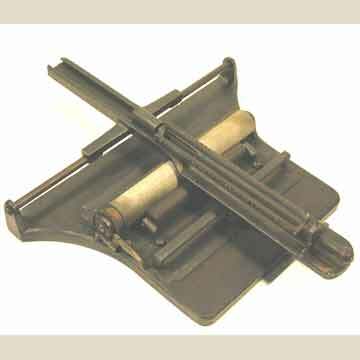 Prouty had patented several printing presses and to build his simple index typewriter he used the heavy material he was familiar with: cast iron. This odd People's (not to be confused with its more common namesake that was built a decade later) consists of a cast iron base with a large triangular bar with type on top. Characters are selected by slidinig the type rail back and forth. Printing is done by pushing the entire thing down. The paper is led around a rubber-clad platen. An ink roller keeps the type inked. It is unknown how many of these machines were built.